I love me a good book about fermentation! While I have many books that look at the art of fermentation, this is the first book I have that digs into the science of fermentation. Yes, there is a science and it’s fascinating! This book is kind of like tradition meets science. There is a reason we use the amount of salt we use, keep our ferments in a dark cabinet and are particular about keeping things anaerobic (maybe on the verge of OCD about it). Our ancestors didn’t dig holes in their backyards to bury their kraut just for the heck of it. One thing I deeply appreciate about Lisa’s book is the fact that I can trust the contents. If you do a simple google for sauerkraut, you’ll come up with 1001 different ways to make sauerkraut. Some good advice, others not so good. Salt amount seems pretty random, fermentation times anywhere from 3 days to 1 year, vessel choices are anything from a wide open crock to special fermentation vessels. Who’s right? I know Lisa has done her research and she explains why she recommends the method she uses. Her advice checks with the research I’ve done. On to the recipes! 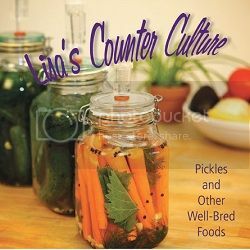 In the book Lisa offers a wide variety of recipes like chutneys, pickles, krauts and fermented beverages as well as recipes for what she calls “ferment companions” which are foods that go well with ferments. She has a recipe for a fermented “Fresh Cilantro Mint Chutney” that sounds to die for. Too bad my cilantro plants all froze a couple weeks ago. And how about “Almost Polish Pickle Soup”? I totally have to try that! I’ve tried out a couple recipes in Lisa’s book and have been more than happy with the results. In her section on Organ Meats, I tried her recipe for Lamb Hearts substituting chicken hearts and gizzards. My kids gobbled them up so fast, I only got 2 tiny hearts for myself. I’ve actually revamped my Orange Ginger Beet Kvass recipe to use some of what she has taught me and I actually like beet kvass now, not just tolerate it. My 2 yo asks for beet juice all the time. Lisa’s method is the only way I do beet kvass now. Dosas are the next recipe I’ve tried. I think I’m in love. Think sourdough lentils and rice crepes. Completely gluten free and while I try to limit my intake of grains, fermenting grains in this way helps them become more digestible. I made my Murgh Mahkani (Butter Chicken) served on top of Lisa’s Urad Gota Dosa recipe. Zero leftovers and I even doubled the recipe! Next I’ll be making Shrimp and Chive Dumplings. They sound amazing! She also has a whole section on dehydrating foods!!! If you follow me on Facebook, you’ll know I’m in love with my Excalibur dehydrator. Next to fermenting, dehydrating is second favorite preservation method. As soon as I get some ParaFlexx sheets, I’m going to try her idea for Kefir Leather. I think this will be a great way to get probiotics into my ferment resistant children (yes, not all of them are pickle feinds). I liked this book so much, while Lisa gave me an e-book to review, I purchased a hard copy to have on hand. I love e-books but, call me old fashioned, there is something about having the book in your hands to flip through. The hard copy of the book is soft covered with a spiral binding. I don’t know about you but I think a spiral binding on a book is brilliant. I hate fighting cookbooks to keep them open. This lays nice and flat. Love that! The gorgeous ferment pictures are all in color too. Now here is the part you’ve been waiting for: Discount and Giveaway! ETA: The discount code is for the e-book only. Not the hard copy. Sorry! For the giveaway, you’ll receive the e-book for free. I’m giving you a few different ways to enter and a chance to enter daily. The more entries, the higher the chance you’ll win. Woohoo! Giveaway is open today until Monday the 8th at midnight. The winner will be announced Tuesday morning. Good luck! I would LOVE to win this book, because I’m trying to expand my repertoire of fermented foods. I want to find more items that appeal to my whole family (right now, I’m the only one drinking the kefir). The organ meat recipe sounds just like what I’m looking for! I am really keeping my fingers crossed on this one!! and interested to learn more about “how” it happens! Healing the gut will save so many! I would LOVE to win this book because i’m just getting into fermenting and have SO much to learn! I am a little obsessed with fermenting these days. This sounds like a good basic book to have. Hi Holly. Did you try purchasing the hard copy? I forgot to specify that the coupon code only works for the e-book version, not the hard copy. Sorry for the confusion! I would love to win the e-book, and need some inspiration for new recipes. However, I tried to order the spiral book with your discount code, but the code doesn’t work. Got a reply from my email to Lisa about the discount code. It only applies to e-book purchases. Sorry about that! I forgot to specify that in the post. Just edited it now. Thanks for letting me know! I would Love, LOVE this! Would love to win this book. Fermentation is still something I am dabbling in and I would love to just jump in! I would love to get some more great ideas for fermentation – it’s so much fun! I’m so fascinated with the art and science of fermenting. I’m still working up to trying it myself, so I’d love that book! I would love this book because I need some ideas on how to incorporate fermented foods in meals. I would love to win this book. I’ve just started lacto-fermenting and I’m having trouble finding more recipes that use Pickl-it jars. Your site has given me the most recipes so far – thank you! Just getting into fermenting and need proven techniques. I’ve been waiting for such a book! I really enjoy using the Pickl-it jars and would love to use this book. Thank you for the chance and also for sharing your love of ferments via your blog! Winning this book would be an awesome birthday gift, I want to spend the next year fermenting everything! I would love a book like this – just getting warmed up to fermentation and am dying to try it out. I am new to this and would love a copy of the e-book. I’ve never been good at culturing… I need all the help I can get!! Has the PickleMeToo discount code expired? It doesn´t work when I try to purchase the e-book?